The longshoremen's union is asking a federal appeals court to shut down a subsidy program at the Port of Portland that's already effectively defunct. The 9th U.S. Circuit Court of Appeals recently heard oral arguments in the dispute, which pits the International Longshore and Warehouse Union against a program that paid ocean carriers to visit the Port of Portland's container terminal. ILWU argues that the port used taxpayer dollars to benefit a private corporation, which violates Oregon's constitution. However, the subsidy program is non-operational because ocean carriers stopped calling at the Terminal 6 last year, citing work slowdowns by the longshoremen. The facility's shutdown is a hardship for agricultural exporters who must now ship crops to Asia from more distant ports, increasing their transportation costs. Andrew Ziaja, attorney for ILWU, told the 9th Circuit that a federal judge incorrectly ruled that the subsidies were constitutional because the money was drawn from rent paid by ICTSI Oregon, the terminal operator. "The port commingled its tax revenue and its commercial revenue in the same fund and in the same bank account," he said during oral arguments on Oct. 3. "It's not possible to distinguish tax revenue from commercial revenue when looking at a commingled fund or a commingled bank account." Randy Foster, attorney for the Port of Portland, said the agency used "suspenders, belt and superglue" accounting methods to keep the rent revenues separate from tax dollars. "The port knows through its accounting systems where the tax revenues are and how they are used," he said. Just because a tax dollar is in the same bank account as commercial funds "does not infect those and prevent me from using those in the future," Foster said, saying the ILWU's theory "defies modern accounting and fiscal management techniques." It's unclear exactly what the longshoremen's union would have to gain from a favorable ruling by the 9th Circuit. Not only is the subsidy program non-operational, but it attracted container traffic to the port that kept ILWU members employed. Representatives and attorneys of the ILWU did not respond to requests for comment by Capital Press. The ongoing litigation is likely an example of the "longshore mentality" of biting into something and not letting go, said Jim Tessier, a longshore labor consultant and former employee of the Pacific Maritime Association, which represents terminal operators. "They operate on a lot of emotion," Tessier said. "They don't like losing and nobody tells them what to do." Melanie Mesaros, a spokesperson for the port, said the Port of Portland is defending the subsidies because it hopes that ocean carriers will return to the container facility. 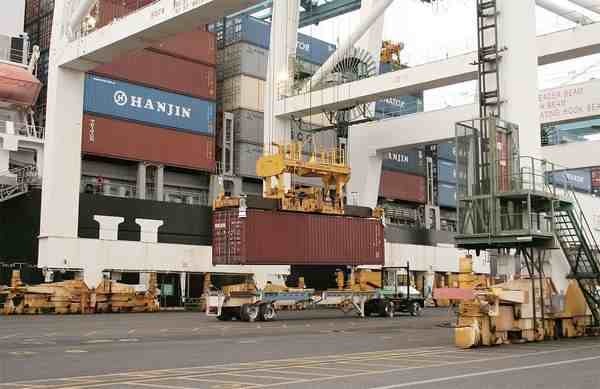 "We are committed to restoring container service at Terminal 6," she said. Mesaros also noted that litigation over the subsidy program is just one lawsuit in roughly a dozen filed between the longshoremen's union, the port and the terminal operator. "This is just working its way through the court system," she said. Michael LeRoy, a labor law professor at the University of Illinois who has studied longshore disputes, said the subsidy lawsuit may be a way to exact pressure on the Port of Portland and ICTSI in the overall legal battle. "Their thinking might be to leverage it to get some kind of broader settlement," he said. "They must see some strategic value in this." Peter Friedmann, executive director of the Agriculture Transportation Coalition, said the ongoing litigation may simply be a form of "inertia," since the case precedes the suspension of activity at the terminal. It stands to reason that the longshoremen would not object to any subsidy program that keeps them working at the container terminal, he said. "It would not be the advice I'd give them, but frankly they're not asking my advice."